A wood burning pizza oven is a time-consuming thing to build and also doesn't cook the pizza nearly as fast as a microwave, but the flavor alone is what inspires people to build these brick and mortar structures in their backyard. It's beyond novelty--something about the smokiness and wood charred flavor of a pizza that has been cooked in a wood burning oven can't be mimicked by any kitchen appliance. It's also economical, because anything that needs to be baked in an oven can use the wood burning oven. Wood burning pizza ovens make delectable pizza. 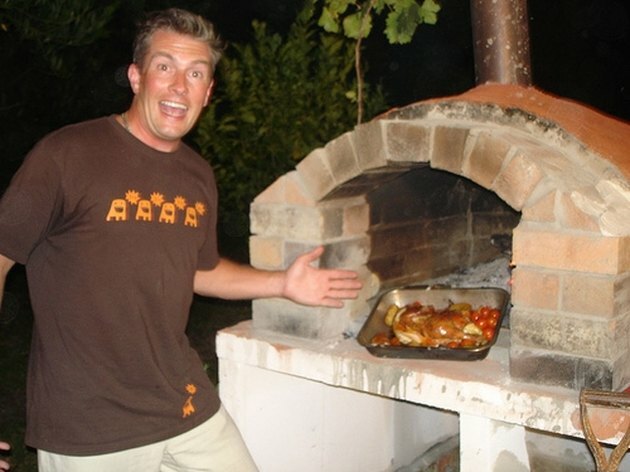 First you need to find a place where you want to build your wood burning pizza oven. Most are built outdoors, unless you have a very large industrial-style kitchen with adequate ventilation. Once you choose the spot in your yard for the oven, the foundation slab of the oven should be built on level ground. If the ground is not level, it should be dug up and flattened so cement can be poured over traditional wire mesh. The stronger your foundation, the more it will support. The stand and insulating hearth are built on the foundation slab and are built to contain the heat from the burning wood and to support the oven and dome. The stand should be built to a convenient cooking height. The cooking surface should be about 40 inches in diameter, according to fornobravo.com. This surface is usually made from high quality firebricks. The bricks that will be the supports for the dome will eventually wear out, as they are the closest to the cooking surface, so be sure to leave them loose before you build the dome, so you can easily remove the top of the dome and replace those bricks as time goes on. When making the dome, do the same thing that was done for the foundation. Wire mesh should be laid out in the shape of the dome and covered with insulating concrete. For the firebricks that make up the dome, use the same high quality ones you used to build the cooking surface. The additional cost of building with the best firebricks is worth it in the long run. Also, using high-heat mortar is recommended by fornobravo, as it will not break down as easily and it will keep more heat in the oven. A vent should be installed when building the dome to help release gases that may not rise out of the open top. Once the main oven elements are in place, the decorating of the oven begins, so it can complement the exterior of your home and backyard. Use tile for a Spanish design, marble for a ancient Roman look or stucco for a Southwestern look. Not only can the wood burning pizza oven cook delicious food, but it can enhance the appearance of your yard.